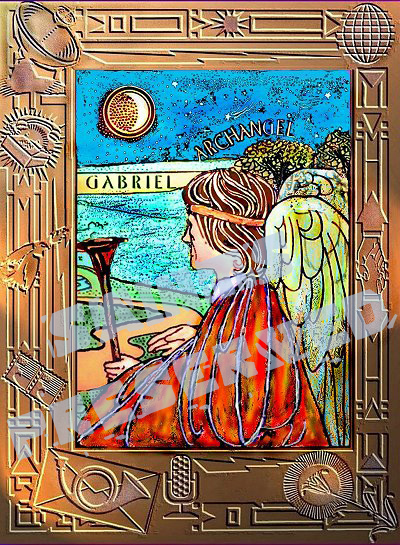 His wings are the color of emeralds, each covered with saffron hairs, each of them containing a million faces, each face with a million pairs of eyes, each eye shedding 70,000 tears. 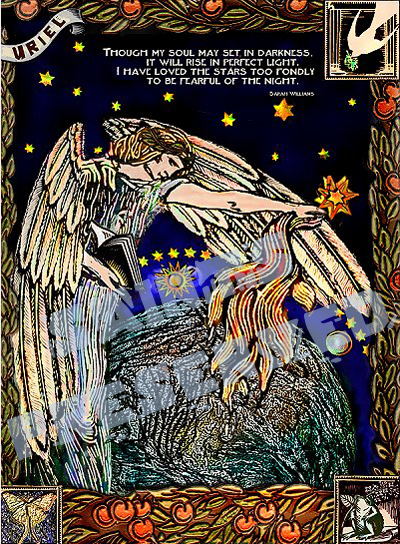 • In the Talmud, his relationship to the other angels is compared to that of the earthly high priest of Israel; thus, he is considered the immediate lawgiver to the prophet Moses on Mt. Sinai, as well as the Protector of Israel. 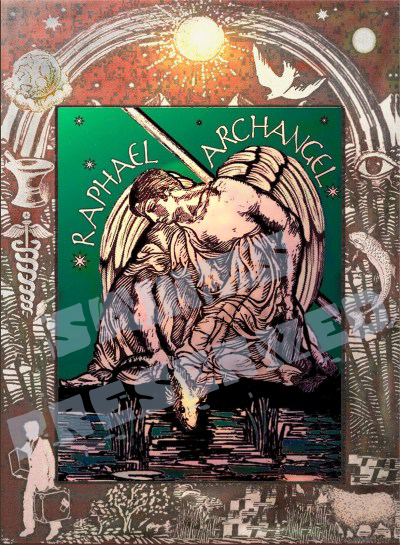 • He often appeared on mountain tops and high places, hence his patronage of mountaineers and paratroopers. 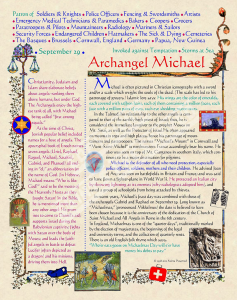 The names “Michael’s Mount” in Cornwall and “Mont-Saint-Michel” in northwestern France accordingly bear his name. He also was seen on top of Mt. Garganos in southern Italy, which continues to be a major destination for pilgrims. 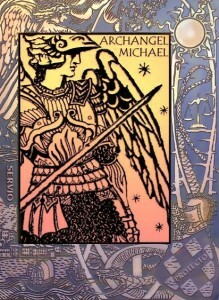 • Michael is the defender of all who need protection, especially police officers, soldiers, mothers and their children. He advised Joan of Arc; was seen on battlefields in Britain and France; and was said to have flown a fighter-plane in World War II. He protected an Italian city by throwing lightning at its enemies (why radiologists adopted him), and saved a group of schoolgirls from being attacked by thieves. 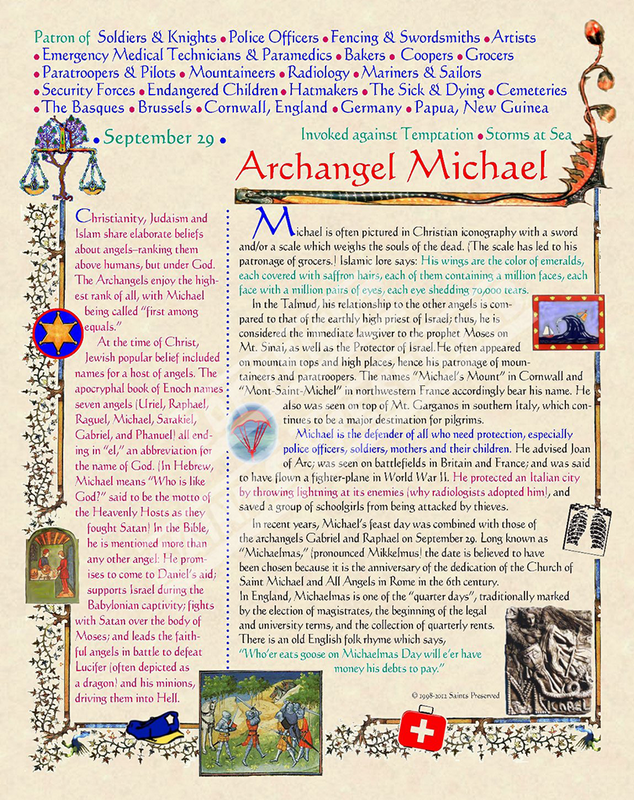 In recent years, in the Roman Catholic Church, Michael’s feast day was combined with those of the archangels Gabriel and Raphael on September 29. 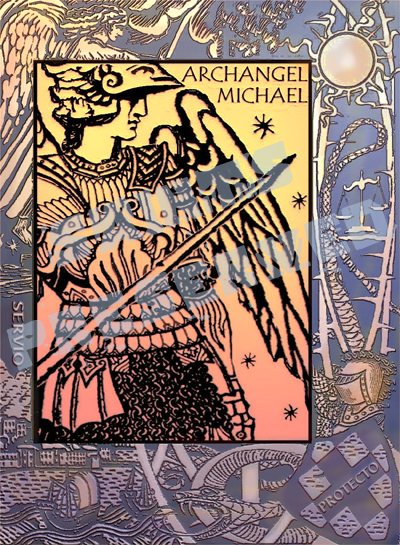 Long known as “Michaelmas,” (pronounced Mikkelmus) the date is believed to have been chosen because it is the anniversary of the dedication of the Church of Saint Michael and All Angels in Rome in the 6th century.